This Featured Application was written and produced in 2007 for our client, Industrial Power Systems, Inc., (IPS) of Jacksonville Florida. The article is posted on their website and the PDF brochure, also created by Concept Communiqués, is still used today as a presentation handout, a customer mailer, and a brochure at industry trade shows. Headquartered in Las Vegas, Boyd Gaming Corporation operates casino across the country and is a significant player in the $32 billion gaming entertainment industry. 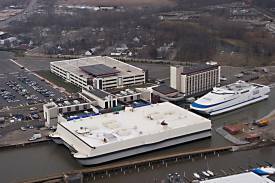 Enter the new improved Blue Chip 2 – more than 50 percent larger than its predecessor (also pictured above), the Blue Chip Casino Hotel is the largest casino boat hull size in the country as inspected by the U.S. Coast Guard. 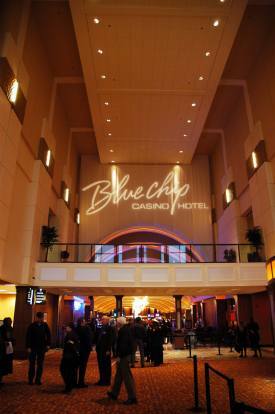 The Blue Chip 2 offers 65,000 square feet of casino action on one level with 2,170 slot machines and 51 table games. The pavilion adjoins the 184-room Blue Chip Hotel and features an elegant steakhouse, action buffet, deli and coffee station, as well as a live entertainment lounge at the main entrance of the casino. Promising patrons “Exhilarating casino action, chart-topping entertainment, award-winning restaurants, beautiful environments and plenty of shopping and recreational pursuits,” meant a tremendous amount of confidence would be placed in the reliability and seamless operation of the casino’s electrical system that keeps this successful operation running 24-hours-a-day, day in and day out. In a conventional marine installation, the ship service generators and switchgear alone supply the electrical power for all on-board facilities and equipment. But the electric power systems of tethered floating casinos are quite unique. What sets them apart from the typical marine application is that while they are moored, they are actually connected as marine-industrial hybrids requiring integrated marine and utility-grade controls. In this arrangement, ship service power is connected in parallel with shore power, as long as the vessel is moored, so that several different ship service/shore power modes of operation are available to the operators. Gaming operations conducted on floating casinos can be lost from service for many reasons including casualty, forces of nature, mechanical failure or extended or extraordinary maintenance. It is therefore incumbent on the owners to equip their vessels with the most trusted and reliable electrical power systems available that comply with United States Coast Guard requirements as to boat design, on-board facilities, equipment, personnel and safety. 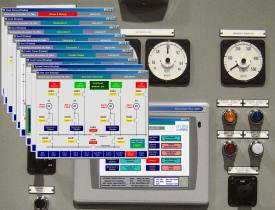 Such specialized integrated marine-utility applications require a great deal of knowledge and experience and Industrial Power Systems has built a solid reputation designing quality control switchboards for both marine and industrial applications. The Blue Chip 2 is a prestigious addition to IPS’s impressive list of riverboat and tethered floating casino applications. Blue Chip 2 was built on-site at its Michigan City facility by Jamestown Metal Marine Sales, Inc. to a design by Guido Perla & Associates (GPA), of Seattle. In addition to their role as naval architects, GPA was also the project’s electrical engineer. The specifications GPA developed provided the integrated functionality, and IPS was contracted to design the switchgear to meet the very specialized requirements. On-board electric power is provided by four 1,825 kW Caterpillar engine-generator sets supplied by NC Power Systems, Seattle. Generator set control, electric propulsion and integration with shore power supplied by the local electric utility is provided by the IPS-supplied main ship service/propulsion switchboard. For the Blue Chip 2, IPS also supplied the emergency switchboard, two 400 HP propulsion thruster motors, and propulsion thruster SCR (Silicon Controlled Rectifier) drives. On the shore-side, IPS supplied the 12.5 kV shore power distribution switchboard, seven 12.5 kV:4160 V and 4160V:480V step down transformers, and five 12.5 kV shore power disconnect switches. The main ship service/propulsion switchboard is constructed with two main power busses—a ship service bus and a propulsion bus. Shore power sources (electric utility) are connected only to the ship service bus and allow for continuous parallel operation with the ship service generators. A bus tie circuit breaker on each bus splits the port and starboard side of the switchboard to allow operation in the event of a casualty situation, such as an onboard fire. 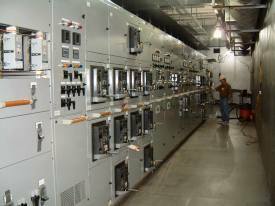 The primary switchboard control for each generator set is a multi-function genset control package (GCP). It provides basic engine control, synchronizing, and engine load control when operating in parallel with shore power. System control and automation is via a master programmable logic controller (PLC) which constantly monitors utility power quality, and a touch screen operator interface panel (OIP) which allows operators to set system modes and program load demand sequences, and also provides system overviews and annunciation. The entire system is designed to operate in a variety of power modes. In the marine mode (isolated vessel), all ship’s service and propulsion power requirements are delivered through the main ship service/propulsion switchboard, independent of shore power. The load demand operation for automatically starting, paralleling, and shutting down generators is based on system load being adjusted from the OIP. In the shore power mode, the vessel is moored and all of the casino’s loads are served through the IPS-supplied 12.5kV shore power distribution switchboard with the ship service generators in standby mode and the PLC monitoring power quality. In this mode all generators are available to provide power on demand when needed. Two additional modes provide complete functionality. In the generator with shore power import mode, utility power can be imported onto the vessel, while the generators are operating in parallel with the utility and the generators configured for base load operation. In the final shore power with generator export mode, generator power can be exported to the land-based Blue Chip Hotel, while the generators are operating in parallel with the utility, the generators are set for base load operation, and shore power to the hotel is maintained at a constant level. The generators are always set for base load operation when operating in parallel with the utility. Generator loading and sequencing is set through the OIP, they are brought online at preset base load levels according to the sequence selected and similarly shut down in sequence as demand changes. The generators do not share load with shore power. They operate in parallel with shore power at base load reference set points set for the generators by the GCP, and the utility provides excess base load and power for momentary system peak loads. Normally, during all modes of operation only the ship service bus is utilized. The exception is the marine mode when propulsion may be required. Power is made available to the two 400 HP SCR drives from any one of three generators, and once selected the propulsion generator will operate exclusively via the propulsion bus. It cannot be connected to the ship service bus at the same time. This design isolates the inherent electrical noise of the SCR propulsion drives, when in use, from interfering with normal ship services, notably casino operations. When propulsion maneuvers cease, the generator can then be switched back to the ship service bus. In accordance with IPS’s high standards of workmanship and professionalism, representatives from Guido Perla & Associates and Boyd Gaming representatives were invited and attended witness testing of the switchgear in Jacksonville. USCG conducted its inspections during commissioning, after the system was installed. For a PDF brochure of this featured application right-click this link.